Skate hard. Hit hard. Work hard. Defensewoman Kacey Bellamy has been a key player in helping the USA Women’s Hockey Team win two silver medals in the Winter Games, and aspires to continue training and playing for the U.S. National Team in upcoming years. 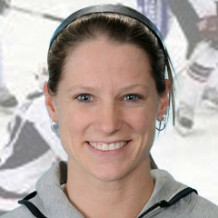 A 2009 graduate from the University of New Hampshire (UNH), Kacey was a five-time, four gold medal-winning member of the U.S. Women’s National Team in the IIHF World Women’s Championship. 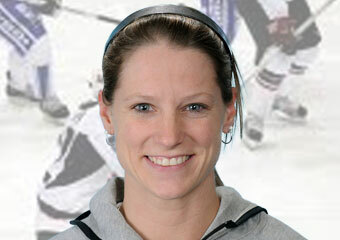 She was an assistant captain for Team USA in 2012 and 2013, and named one of the team’s Top-Three Players in 2009. She was also an eight-time member of the U.S. Women’s Select Team for the Four Nations Cup, and twice skated for the Under-22 Select Team that competed against Canada in 2007-08. At UNH, Kacey ranked third in all-time career points by a defensewoman, earning RBK All-America First Team and Hockey East First Team honors as a senior. She was also named UNH’s Jim Urquahart Student-Athlete of the Year during her college career. Her greatest personal disaster? “Getting cut from the development team right before my sophomore year. After that, I told myself I would do whatever it took never to get cut again,” she says. After three seasons of professional hockey with the Boston Blades, where she helped her team win the Canadian Women’s Hockey League’s Clarkson Cup in 2012-13, Kacey has joined the collegiate coaching ranks. In 2014-15 Kacey began her first season as the assistant women’s ice hockey coach at Merrimack College, located in North Andover, Massachusetts just north of Boston. In 2015-16 the program will making its competitive debut in the ranks of Division I schools. 2-time silver medalist: 2014 Winter Games in Sochi, Russia and 2010 Winter Games in Vancouver, B.C.